Maryam Faiz’s path to a career in stem cell research started off on the soccer field. A talented athlete, she was playing for her university team when a teammate from Barcelona suggested Faiz visit the city. She quickly fell in love with Spain and arranged to do an exchange program there, completing her bachelor’s degree. Faiz never set out to be a scientist, but her plan to go to medical school shifted as she became immersed in her studies in the lab there. The serendipitous moments continued, as a collaboration with a lab in Sweden resulted in Faiz doing her postdoctoral studies there. It was in Sweden where she met one of Canada’s foremost experts in regenerative medicine, Dr. Andras Nagy, at a conference. He invited Faiz to work in his lab at Lunenfeld Tanenbaum in Toronto and it was there that everything came together. Faiz’s work with Nagy led to what she calls her “unicorn position” at the University of Toronto, where she has recently opened her own lab. There, she is working on an OIRM-funded New Ideas project. Her research, which focuses on regeneration in the brain, is complex, but the goals could have important impacts on stroke recovery. “There are neurons in the brain, some of which are responsible for transmiting information, and then there’s a whole host of other cells,” she explains. “One type of those cells is called an astrocyte. After stroke injury, astrocytes will respond and they help mediate a bunch of post-injury processes in the brain. But one of the interesting things they also do is form a scar, contributing to scar formation in the brain. Much like a wound on your skin where you can get a scar, you can also get a scar in your brain.” As you might imagine, a scar in the brain can mean serious and long-term impacts for the patient. Faiz is now looking at whether you can change the fate of these cells by removing the cells that are detrimental to injury repair and turning them into neurons that might help with repair. “To date, nobody’s really shown if there’s a correlation between the strategy of reprogramming or turning one cell type into another directly in the brain and functional outcomes, so we’re interested in seeing if it could actually be used as a therapy for different brain diseases,” she says. By utilizing the cells already present in the brain in the repair process, there are less issues with immune rejection and this approach is less invasive then traditional methods. This type of discovery level work is important to determining if something unexplored can lead to a breakthrough that might have larger implications in the future. Basic science often takes years to show dividends, but it can have enormous implications—most of the major health discoveries of our time have been made due to projects that started with a kernel of an idea that was nurtured over decades. Morshead has been essential in the process of setting up a new lab, something that can be daunting for a new investigator. Faiz admits that after working in state-of-the-art labs like those at Lunenfeld Tanenbaum, starting from scratch was challenging. “It’s hard because you have your start-up funds and you have to budget for a bad first year or two, because you don’t know if you’re going to get more funding. 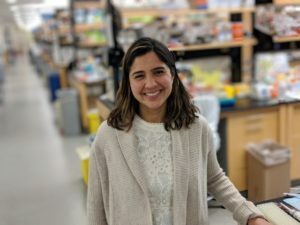 So you’re really conservative about what you want to spend and what you want to buy for your lab.” Faiz turned to Morshead not only for scientific collaboration, but for advice on her new lab and for the use of Morshead’s lab when she needed it. “I think that mentoring is absolutely critical for any new scientist and even beyond science,” says Morshead of the relationship. “Running your own lab, honestly, it’s like running a small business, and we’re not trained in that. I can ask a good question, I can design an experiment, but tell me to handle the financials and those are things I need help with.” Bringing value beyond science is an important role Morshead is happy to take on for Faiz and others. Now much more established and ready to dig deeper into the role of astrocytes in the brain, Faiz has come quite a way from her days on the soccer pitch. Her long-term goal? To create an inter-disciplinary network to study important questions about astrocytes in the brain, continuing the collaborative thread that runs through all of her research.